$15. Purchase and pay for this publication securely through PayPal. First we want to congratulate Scooter and Star United, who are this year's Mini Corps champions! Also, check out the updated logo. Do you like it? Chances are your horn does not have a french horn-sided throat. Some traditional Mellophones might, at which point you can easily use french horn mutes. This will take some trial and error. Tenor trombone (or sometimes bass trombone) mutes seem to work extremely well, but not the flared ones. Since you won't use them much, I recommend the Humes and Berg Stone-Lined mutes. To quote Greg Monks: "The straight mute is perhaps the most important of the mutes where the Mellophone is concerned. The moment you place a straight mute in the bell of a Mellophone, especially the “classic”, it is then that you realize the Mellophone is in no way related to the French horn. The instrument automatically sounds like a tenor cornet or trumpet, and there is often the instinctive impulse to play it like one." As for cup mutes, Greg says: "Generally speaking, there are two types of cup mutes. One has a cup with a scalloped edge, and the other has a straight edge that lies closer to the bell. The former has that classic “cup” sound, whilst the latter has a sound often described as “velvety”. Again, these mutes are made for the French horn, but the tenor and bass trombone variety will do." Mark thinks a bubble (or Harmon) mute is also useful, but it's difficult to try on a Mellophone due to the flare of the mute itself. This requires further testing. If you're a city dweller, you need to find a good practice mute. Practice mutes can effect the horn's natural resonance, which effects your breathing and how much you "push" when you play. On the upside, it's not unlike running with ankle weights. Take the mute out and you're suddenly very, very powerful. Another problem with them is that it effects the weight of your horn, as well as your intonation. But, again, if it's between using a practice mute and not practicing at all, I'd grab that puppy. Practice mutes, unlike others, totally seal the bell. The cork surrounds the mute evenly. The result is a total muting of the sound, with the desired effect being as inaudible as possible. I personally recommend trombone mutes in lieu of French Horn mutes as the seal occurs further up the bell. Yamaha's Silent Brass works quite well. The alto trombone version should fit the average Mellophone. The down-side is that the Silent Brass mutes are quite heavy and won't stay in the bell. They're also extremely pricey as they include all sorts of electronics that make for a great practice session, but are quite cumbersome. The Denis Wick trombone practice mute also works quite well, but you really should test it on your horn first as it is flared. The Humes & Berg Mannie Klein "Sh! Sh! -- Quiet" (you gotta love the name!) Stone-lined practice mute for Trombone is VERY good. Al's tried both the Trombone and Tenor Horn mute and found for the Mellophone the Trombone mute is the way to go (the only difference is the positioning of the rubber, with the Tenor Horn mute's being a bit lower). Al's been using it for a while and is quite happy with it! Mark has heard of the Best Brass mute, which is small, light and works well. We haven't tried it, but Al is willing to invest in one and report back. Granted, there are other mutes out there, but considering the infrequency you'll use them, having a good straight, cup and practice mute (and possibly a bubble mute) in your arsenal should be enough (in our opinions). Listening Assignment: "Nessun Dorma" from Phantom Regiment's 1991 show. It's obvious they're still playing G bugles. The soloist is none other than our friend J.D. Shaw! Al and Mark discuss how Corps shows are more theatrical and thematic then they once were. Mark sort of misses the old days, but Al likes how they've evolved. With us this week is Tony Vaccaro, President of the IYM Corporation. Tony explains the genesis of the IYM Corporation, their Mellophone mouthpiece and Larry Kerchner's involvement. IYM believes the sound begins with the mouthpiece. It's also the source of intonation problems. All aspects were re-designed and deliberately less trumpet-like, including the cup and rim. If anything, it's more French Horn-like. The mass of the mouthpiece controls unnecessary vibrations, and the weight of it acts as a counterbalance, which helps reduce hand injuries. First testers were French Horn players. The Cavaliers also tested it extensively and re-scored their music accordingly. Judges seemed to like the sound. Other manufacturers have stopped development based on this mouthpiece. John feels it's the "next generation" of Mellophone mouthpieces, being in between a Mellophone mouthpiece and a French Horn mouthpiece. With the old mouthpieces, the Mellophone becomes a lower trumpet, but with this mouthpiece it functions more as a true middle section. Mark likes it in that he can switch back and forth between French Horn and Mellophone in mid-session with no stress. He also likes the sound that it produces. French Horn players can go from marching season to concert season with no adjustment. Reportedly, the tone doesn't cut the same. The IYM causes the horn to play more in tune, which makes the tone behave differently. It also requires the player be much more relaxed or it will not respond properly. It can't be overblown. Works best if everyone in the section is playing with the same mouthpiece. Tony says more Corps are looking to the IYM mouthpiece. There will not be other versions of the mouthpiece (cups, etc.). There are currently two versions, one for the King horns and one for everything else. The only difference is the size of the stem (the King has a larger receiver). Listening Assignment: "The Great Fire of 1871" from the Cavaliers' 2005 show "My Kind of Town," arranged by Richard Saucedo, Bret Kuhn & Erik Johnson. Mellos are featured on ladders! This is the first time the IYM has been used by a Corps. With us this week is J.D. Shaw, a literal legend in the world of Drum Corps and arranging. Started with the Sky Riders from Hutchison, KS from 86-89, and then Phantom Regiment in 90 and 91. Played flugelhorn his first year, then Mellophone and French Horn. Now he's the arranger for Phantom Regiment. After aging out, he taught the horn line for two years. A few years later (1998) he got a call from the Boston Crusaders to help them out. In 1999 he wrote the show and taught them. Invited back to Phantom in 2002. Maintains Phantom's "sound" with arranging and pedagogy. Keeps low brass a constant presence with color and brightness. Brings up tenor frequencies. Scooter calls it "organ-like." Not necessarily a dark sound. Writes Mellophone parts that he always wanted to play. When he was young he used to practice everybody's Mellophone licks. When he went to Phantom, there were 10 French Horns and 5 Mellophones, which had different functions. Deciding what to score is a group effort (but "1000 Airplanes on the Roof" was his idea!). Once the show is scored, he tries to spend 5 or 6 weeks with the corps. He spends the first 3 weeks with him and functions as the caption head. Then he shows up at the end of the season to help towards Finals. Al LOVES Boston Brass, which keeps him busy throughout the year. Admittedly, J.D. doesn't play Mellophone any more, though he did assist in designing horns for King. He also recently got to play his solo from Nessun Dorma that he played in 1991. Swore off marching French Horns. As for mouthpieces, Phantom uses the Karl Hammond mouthpieces. He likes the Mellophones to be a little brighter, preferring more of a cup than a "V" shape. Most good French Horn players should be able to switch between a French Horn and Mellophone mouthpiece. Doesn't care for the sound (or intonation) of a Mellophone played with a French Horn mouthpiece. Mark asks about how the sounds of the ensembles have changed through the years. The main change was going away from the G instruments. Now the sound is warmer, which isn't always a good thing. But now for adjudication purposes, many corps are abandoning the particular tone qualities that made them unique to a more homogenized sound. Feels true passion happens right when it feels like everything is going to fall apart. This is why live performances are so different than recordings are today. Listening Assignment: "Firebird - Finale" from the Phantom Regiment 2007 show "On Air," arranged by, of course, J.D. Shaw. Mellos are jazz running at 3 to 5 during the ending. It's crazy! You can see videos of rehearsals on YouTube. On board today is Ken "Taters" Flask, Blue Devils B and A Corps alum through the 80's. He also plays in the SCV/BD Alumni Corps. He attended both the Semi-Finals and the Finals in Pasadena. The vibe is great - everybody there loves it. Lots of booths, vendors and excitement. The weather was also excellent. The stadium was packed - at least 32,000 people, and all were enthusiastic. There was also a "party" atmosphere with lots of gatherings before the show. It was a good year for Drum Corps, and the crowds always go crazy for greatness. The level of quality this year was fantastically high and very competitive. From a Mellophone standpoint, the quality keeps increasing. Good crowd pleasers, particularly Carolina Crown and the Bluecoats. (Al agrees about Crown, of course.) Crown's performance was very, very clean. Al and Ken hope that Corps like Crown, Bluecoats, Glassmen and Blue Knights will eventually win. Phantom had the most powerful Mellophone line of the evening. Al is nuts for J.D. Shaw's arranging, especially the Firebird finale. Cadets got robbed a little. Ken feels the narration hurt them a little, especially with crowd appeal. But their Mellophones were outstanding! Cavaliers had a great show, but never reached their impact level than they have in the past. Bluecoats had lots of impact. Ken's top 3 were Blue Devils, Cadets and Phantom. Al still doesn't quite "get" the Blue Devil's show. He gets the beginning and the end, but gets a little lost in the middle. Ken has heard this a lot from others, but he does "get it." Favorite Mellophone sections: Cadets and Phantom. Phantom was the most powerful. What is a Descant horn? 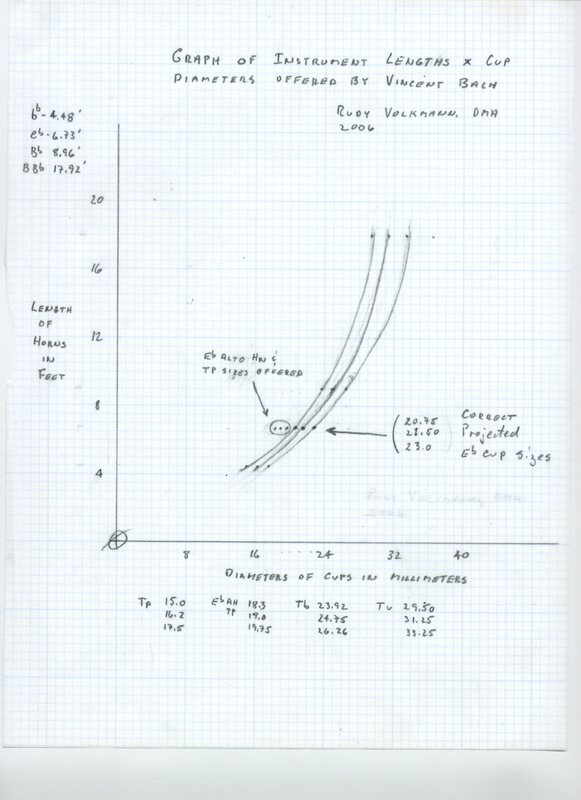 History/Design features: High F tube. Descants usually double in B-flat/high F fingerings the same as the Mellophone on the high F side. Built to take a horn mouthpiece. Very high quality instruments available, but intonation is a bit iffy on the high F side. Best to use a smaller mouthpiece. Originally they were single horns (Alexander made one), but now they're mostly doubles. One can always use the "poor man's descant," or yanking out all the F slides to make the horn lighter. Farkas suggests this. Often used in classical situations for high register playing and for jazz. Most jazz horn players use the B-flat/high F horn (based on Paxman's design). The double descant has few limitations than a normal double horn. The worst is the lower treble clef area. Triple horns can be a little heavy. Paxman's latest compensating triple handles well. It weighs about the same as a Lawson double. Single Descants can sound and feel like a Mellophone. Mellophoniums are also very similar to Descants. John feels the Descant has a better higher register than the Mellophone. Sadly, he's right. The YMP 203 had a decent high range, but others are a strain. Mellophoniums are even worse. Listening Assignment: "The Grove by the River" from the album "Horn of Plenty" by Meir Rimon with the Israel Philharmonic. Mark has a good story about Meir Rimon. We're still trying out new theme music. Our guest today is Dr. John Q. Ericson, Associate Professor of Horn at Arizona State University. John has been spending his summer working with the Mellophone and how it will impact his students. John keeps an online Blog about many things, including the Mellophone. He also authors The Mello Zone website. Most Horn teachers have three suggestions for their students in regards to marching: Percussion, Guard or Drum Major. The center of the French Horn is also quite lower than the Mellophone. On the Mello, warm up low and plays lots of pedal tones. Al says to give the French Horn plenty of time early in the day if your marching rehearsal is later. If you're in a Corps, it's harder. Buzz on the French Horn mouthpiece when you can to maintain your embouchure. But good students tend to get their French Horn chops back fairly quickly after marching season. All suggests the IYM. Embouchure-wise, try to avoid the trumpet-like embouchure. Try to use more upper lip. John likes using a bent mouthpiece. Just don't bend the lead pipe! One of the most important things you can do on Mellophone is warm down. Play as low as possible, lot of pedal tones. In regards to the Tenor Horn mouthpiece, it is hard to play a mouthpiece that size if you are a French Horn player, and once you're used to it, going back is extremely hard. They are, though, easier to get used to than the Mello 6 mouthpiece. Use a dime to gauge your cup and rim size. Listening Assignment: "With the Wind and the Rain in Your Hair" from the album "Mellophone" by Don Elliott (which is STILL unavailable on CD). As always, Scooter is a fountain of knowledge! Clip is from 1953 and a good example of an E-flat Mellophone with a large mouthpiece. We're trying out new theme music! Al reports on his trip to Hershey, PA, and Music in Motion on July 9th, sponsored by Youth Education in the Arts. The audience for these are great! Everyone is very supportive of all corps present. The Troopers received a hearty welcome! Al interviews 4 people who have never seen Drum Corps live before. They all really liked Carolina Crown's show! Al was very impressed with the Blue Knights. Blue Devils were good, but the audience didn't completely "get" the show. People weren't so much against the Cadets' use of narration, but most felt it was a bit much. Listening Assignment: "Wild Horses" from the 2007 Carolina Crown show "Triple Crown"
A gutsy ballad. Great releases. Also, those are embellishments, not cracked notes. Follow-up from last week: As soon as we posted, we got an additional link called "The Mello Zone" from John Q. Ericson, Associate Professor of Horn at Arizona State University. We love John and plan on having him on the show very soon. Reminder that Al will be at Music in Motion in Hershey, PA on July 9th. He'll be recognizable because he'll be wearing MelloCast gear (available now from CafePress!) and he'll try to see how far he can take his digital recorder along. So, if you see him say "hi" and he'll give you a shout-out on the next podcast (and a little swag)! Searching. Searching under the word "mellophone" isn't enough. Also try "mellophonium" and "mellowphone." Then, search all French Horn and Other Brass listings. You may even want to check Antique Musical Instruments. Many sellers don't know what they've got, so they may list it as an "Antique French Horn" instead of a Mellophone. Check for misclassified ads. Marching horn, baritone, french horn, etc. Don't expect the seller knows what he's doing, hence misclassification. 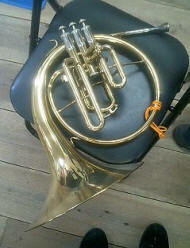 Not sure if it's a French Horn or a Mellophone? Usually it's pretty obvious, but if it's in question, look at the valve slides. Research the instrument. Check out completed auctions of the same instrument and get a fix on the likely market value of the instrument. As Al's dad used to say; "An item is worth as much as someone is willing to pay for it." Additionally, check in with Kenton at Horn-u-copia in case he's got some information on the make/model that's being sold. Check for excessive dents and bent lead pipes. Does it have a case? This can be an attractive feature and therefore, the more it will cost. Does it come in F, E-flat or both? The more keys the horn plays in, the more attractive and, therefore, the more it will cost. There is no perfect traditional Mellophone manufacturer. It's all trial and error. Don't expect the seller to know if the fifth partial is in tune or not. Research the seller. Low numbers or negative feedback should cause concern. It's also not uncommon for someone to find some old horn in granddad's attic and is selling for the first time. There's a certain gamble when dealing with eBay. Does the seller accept PayPal? That's an indicator that they're a little more reputable than others. If the seller ONLY takes money orders, check their feedback carefully. Ask questions of the seller. Don't hesitate to ask for more photos. If you see a horn and want a second opinion, go to Horn-u-copia, or send us an E-mail. We'll give you our opinion. Beware of snipers (auction participants who start placing their bids at the final moments). It is very common for the price to jump up suddenly within the last few minutes. There are services that will do this (like eSnipe). Don't be afraid to "walk away." Predetermine the most you'll pay for an instrument and stick with it. Due to snipers, you will probably have to put in the actual amount you'll pay. If you try to lowball, you may get burned. Have the horn insured. Things get lost in the mail. Don't let it be your horn! Packing. Request good packing. Also, if you're selling, be sure to pack it well. Newspaper isn't enough. This 3-CD set is a compilation of 6 Johnny Richards albums. 2 of the albums feature Ray Starling, including "Spanish Spoken Here," where this clip comes from. Though this clip is relatively tame, the album as a whole has some of the best Mellophone playing EVER! Scooter recently featured Ray Starling on his own podcast! Give it a listen! The Middle Horn Leader and Al's Mellophone Page are the de facto champs. The two most prominent sites are The Mellophone World Order (which has a player index) and Mellophone Madness (which has a large collection of links) -- both are terribly out of date and most links are dead. Al and Scooter like Uniqhorn's French Horn Mellophone Discussion. Also good is Eric Trotman's Past & Present Brass wind Instrument collection: Mellophones, Altophones and Frumpets. It's mostly pictures and he does sell them from time to time, so check back often. Sadly, he does know what they're worth, so they ain't cheap. Also deserving mention is Horn-u-copia, which has lots of good indexes. They're best at identifying old horns. Then there's the What is a Mellophone page from hornplayer.net. We have a lot of respect for the hornplayer.net folks. Scooter recommends this page, despite the cheesy music, who claims to have a VERY old horn. She also has some interesting pictures of Stan Kenton's Mellophonium section -- in color! Props also go to the College sites with good Mellophone pages. We've found good ones at Penn State, Indiana, Ohio and Illinois. Both Middle Horn Leader and Al's Mellophone Page have links pages, which should be checked out. One can also find Mellophone players and fans on Facebook and MySpace. Scooter found a Facebook page of someone wanting to sacrifice a Mellophone. Composed by Josh Talbert, who wrote it as an I&E piece for Mellophones and Baritones. Blast picked it up and did some re-arranging, including adding synthesizer. The visuals are awesome! If you haven't seen it live, watch the video! Al gives the caveat -- warming up on Mellophone is no different than any brass instrument. Also, we can't recommend how you SHOULD warm up, but at least we could share our warm-ups with you with the hopes of sharing techniques. Slow, long tones from G, going down chromatically, returning to the G after each descending tone. Repeat starting on low C, then 3rd space C.
Whole notes starting on 3rd space C, playing C-B-B-C, B-Bb-Bb-B, etc. going down chromatically, focusing on the air stream between each note. Lip slurs for some flexibility. Arpeggios from the Art of French Horn Playing book for pitch centering and range expansion. 12 major scales and arpeggios, plus chromatic exercises from the Arban book. Mark talks about his warm-ups. Studied with John McNeil to fix some embouchure problems and the Carmine Caruso method. Uses warm-up from John Clark's Exercises for the Jazz French Horn Player. Also does the Flexus studies (more than Al does). Unstructured improvising and exploring the instrument. Scooter says you should differentiate between a warm-up and practice. Drum Corps warm-ups take hours, but that's to get everyone playing together. They're usually very simple with lots of slurs but very precise. Mouthpiece buzzing? Mark does it as part of his warm-up, but Al doesn't prefer it. Scooter says Keep It Musical. Just going through the motions isn't enough. Take a minute to sightread. Use the Arban book as there's so much in it. But the only way to improve sightreading is to practice sightreading. Use a metronome and a tuner (but don't stare at it), record yourself if possible. And play music. Don't forget to rest as much as you play. Scooter likes the Allen Vizzutti books The Allen Vizzutti Trumpet Methods Technical Studies, Harmonic Studies and Melodic Studies. Watch your posture. The better posture you use, the better you'll resonate. Check out the Alexander Technique. Bob Curnow (formerly from Kenton's band) does their arrangements. The question isn't so much player preference, but what the horn itself requires. Is bigger better? Historically, after World War II public school music took off, and the Mellophone was designed for school use. The manufacturers would include a smaller mouthpiece as the Mellophone was frequently played by the weaker trumpet players. Rudy was able to get a hold of a Jägertrompete mouthpiece, which is an alto-range cup mouthpiece, and have subsequently had copies made. A Tenor Horn mouthpiece goes to around 19mm, and the Bach Mellophone mouthpiece goes to around 19.75mm. The Jägertrompete clocks in at 22.25mm. Al plays some clips using the mouthpiece that comes with the horn, a Tenor Horn Wick 2, the Jägertrompete and a Giardinelli C4 French Horn Mouthpiece. When Rudy used the Jägertrompete, all notes were in tune. Rudy explains the parabola and his experiment with measuring the parabola of different brass instruments' mouthpieces, and from there was able to extrapolate what the size of a Mellophone mouthpiece should be (assuming the trumpet, trombone and tuba are correct). This doesn't apply to the French Horn. Relating to Corps, Scooter says a mouthpiece larger than 17.5mm would never fly as it won't produce the tone necessary to function on the field, nor support the range that the instrument plays in. Mouthpiece Express sells a Bach Mellophone mouthpiece that is 19.75mm. This tell us that prior to World War II, the Mellophone traditionally used a larger mouthpiece. The IYM is a good alternative for French Horn players who have to play Mellophone and are concerned for the embouchures. The mid-range isn't too strong, though. Scooter knows a LOT about this recording. Scooter is suspiciously absent this week! (It's all Al's fault!) But we're happy to have Paula Hyman back before she leaves for the summer to work with Teal Sound. So, Yamaha. They've become the horn-of-choice for many. As per Kenton Scott, the original YMP-201 dates from 1986-1997. The YMP-201 is an actual traditional Mellophone. Al used to own one. They're heavy, the bell is too big and very uncomfortable to hold. Had a large throat and an open flare. As per Paula, they were very bell-heavy. Also the high F didn't slot well. Smaller throat, more bell flare. Still bell-heavy and high F (and low C) still didn't slot well. Fixed the high F and low C slots. Upper register is a little more of a strain than on the 203. (Al feels vindicated.) Still, you can easily get used to it. Listening Assignment: The Closer from the 2006 Cadets show. 2005 closer was good, but they all liked this closer better. Mark likes that you can hear the middle of the Corps, not just the sopranos and the pit. Al likes to follow The Cades online with All Access, as well as The Blue Devils' Blue View. Detailed reviews of each horn can be found on The Middle Horn Leader. Overall, not a bad horn. Not great, but not bad. The best of the horns tried, but still not quite as good as the Yamaha. Almost identical to the King 1120. A disappointment. Uncomfortable to hold. Listening Assignment: "La Suerte De Los Tontos," performed by the 1979 Blue Devils. Stan Kenton chart, arranged by Johnny Richards. This is a Robert Downey corps arrangement. Al has an amusing story about his experience with this piece. This is a good representation of the Blue Devils' mid-voice, using marching French Horns (including a marching French Horn solo by Scott Tyrette). Flugel players switched to Mellophones for this number. First we revisit last week's episode about the Mellophonium with a message from Kenton Scott. Now to Mark. Why did you start investigating the Mellophone for jazz? As a horn player you deal with lots of environmental issues or wrestling with the horn. The French Horn is not inherently nimble. Didn't want a different version of the French Horn. Mellophone already has a history in Jazz. Mellophone is close to the sound "in my head." What have your experiences been so far as a Mellophone player? Brass players are unforgiving, but other instrumentalists love it (particularly bass players). Started subbing with the Wade Barnes Big Band, and subsequently added a Mellophone chair. Sean Sonderegger (a Tenor Sax player) heard him at The Spoken Words Cafe, then started sitting in, then asked Mark to join his band, Warrior Circle. Recorded a demo at a recording academy. What are the significant differences to you in playing Mellophone vs. French Horn? Mellophone makes a different statement. Jazz elements are easier to execute. French Horn doesn't speak the same way. French Horn can do what it does, and he can use the Mellophone to do what it does best. A project has been in the works for about a year that has 3 or 4 cuts with Mellophone, but he used the Holton, which didn't sound as good as he'd like it to. Wants to re-record using the Yamaha. In the two clips from Warrior Circle, one he plays the Yamaha YMP-203 and the other the King 1120. The King had an airy tone, while the Yamaha was a little fuller. Mark also scores films, including a documentary about the deaf. Still looking for a "professional" horn, but the Yamaha may be as professional as you can get. Might get a custom made horn (Inderbinen makes some interesting instruments). Piece was written for his previous album, which features vibes. Mark is playing the Yamaha on this recording. Second clip -- Mark's solo on "Long Lug of Limbs," written by Sean Sonderegger. A Mellophonium is a traditional Mellophone with the bell pointing straight out. Phil's Rugs-n-Relics website shows a Boosey & Hawkes Marching French Horn in the same configuration that dates back to 1954, predating the Conn 16E by 3 years. Pros of the Mellophonium: they have a unique sound. That's about it. Scooter has a review of the Conn 16E at the Middle Horn Leader. They came with a large bore mouthpiece and an E-flat slide, which, oddly, helped the horn play more in tune than on the F side. You can frequently find them on eBay, though the condition is always questionable as the metal is thin and they are frequently mistreated. Why did moving the bell forward make the horn so bad? It was bad to begin with. Moving the bell forward just amplified it. Did the Mellophonium evolve into the Marching Mellophone we know today? Kenton Scott at Horn-u-copia is uncertain but thinks not. He has lots information and photos of Mellophoniums on his site. Scooter also has lots of information on the evolution of the bugle. It is likely that the Mellophonium died out and Drum Corps bugles eventually became the Mellophones we know today. F.E. Olds was the first to take their bugles and put a valve cluster on it. They eventually sold the line to Selmer/Bach. Greg Monks shows us that Mellophones have always had bellfront versions all through history. This is nothing new. Stan Kenton employed a Mellophonium section from 1960 to 1963. He called on Johnny Richards and Gene Roland to create a unique sound. Scooter has an interview with Tony Scodwell about his experiences as part of Kenton's Mellophonium section. Same solo appeared on the Mellophonium Moods album. These albums are basically bootlegs of live performances. Scooter has an interview with Jo Lea Starling, Ray Starling's wife. He didn't have an affinity toward the instrument -- he was a jazzer and would play anything put in front of him. Clip 1: Arguably the worst mellophonist ever. We still give the guy props for trying. Why he posted it on YouTube is another story. Clip 2: University of Wisconsin's Mellophones performing "Tico Tico"
Nice arrangement but the tone is questionable. You can see the full clip here. Listening Assignment: "Geneva's Move" by Lee Konitz featuring Don Elliott. Originally a Miles Davis track called "Move"
Last two years with the Cadets she was the Horn Sergeant. Duties included overseeing the horn line and being their "mom"
Listening Assignment: "Liquid" by Jay Bocook from the Cadets' 2005 show "The Zone." E-mail from Bob Bohanek from Mendota Heights, MN, asking about I&E suggestions. Scooter tells us about the I&E competitions. Al goes on a tirade about how French Horn music really doesn't work well on the Mellophone. Aside for the fact that they play in the same key and are brass instruments, the similarities end there. Mellophone is a much closer cousin to the Tenor Horn. Al thinks all Mellophone players need to be familiar with the Tenor Horn. Background on the Tenor Horn. Visit Al's Tenor Horn Page. For CD's, go to the Midland CD Club. For printed music go to Just Music. Go to the Recordings page at Al's Tenor Horn Page to see good recordings. Greg asks about cornets and Saxhorns. Al suggests paying a visit to Greg's Brass History Page (which is a sub-page on Al's Middle Brass Pages), written by Greg Monks. Histories directly point the Mellophone to the Tenor Horn, or at least more so than the French Horn. Scooter recommends going to the Great American Brass Band Festival in Danville, KY. Listening Assignment: "Capriccio Brillante" by Herman Bellstead (arranged by Sandy Smith) from the album The Voice of the Tenor Horn by the Yorkshire Building Society; Sheona White, Tenor Horn soloist. Yes, you can play pieces like this on the French Horn, but it fits the sonority of the Mellophone better. Tenor Horns have the same virtuosic technique Cornets traditionally have. So, to answer Bob's question -- find Tenor Horn music. Al recommends The Gordon Higginbottom Collection. Scooter says to be different and enjoy what you play. Just don't do Carnival of Venice! A big discussion on vibrato ensues! Look at the link on I&E Link on the Middle Horn Leader for lots if information, including YouTube videos. What's in your closet horn-wise?
. Your best bet is to find used horns, and eBay is an excellent source. Just be patient and experiment. Fortunately, they're not too expensive. Amati AMP-202 -- pretty darned good, but the valves are awful. Holton Collegiate Hatbox Mellophone -- plays surprisingly well! Distin Altophone -- Bought used in awful shape, but Chuck at the Brass Lab in Manhattan worked his magic. Dotzauer Circular Alto -- This horn is huge! It's almost a French Horn! The extreme registers are difficult. Shout-out to Raison Brass horns. They're cheap but they play well. The valves are tough, and the case is awful! Yamaha YMP-204 -- excellent horn! King 1120 -- played through college. Also a fixer-upper thanks to Chuck. Holton 601 -- surprisingly good! 2 Conn 16E's -- brand new! All horns will have their limitations. Conn 16E ruled the 1970's. Bach ruled the 1980's. Now it's all about Yamaha, Dynasty and Kanstul. All horns have their Achilles' Heel. Dynasty horns were very big in the 80's. Most kids are stuck with whatever your band director has. The Mouthpiece is crucial. Take the time to try combinations to find what works best for you. Only traditional horn is a Buecher from 1924 that has slides to play in F, E-flat, D and C. Played with flugel mouthpiece. A Wick 5 opens the sound up considerably. Does NOT work well with the IYM mouthpiece. Blessing -- received from John McNeil. There's a trigger on the first valve slide, which makes playing uncomfortable. It's also front heavy and has bad intonation. 2 Holton 601's -- one customized by Josh Landress at Sam Ash with a new lead pipe. Doesn't record well. Yamaha 203 -- gets lots of good comments on the sound. Plays with the Kerchner IYM mouthpiece. Scooter says the Yamaha rewards hard work. Closest to being a "real instrument." Oct 59 though Dec 63, Kenton was experimental and wanted to try something new. Experimented with different types of instruments before settling on adding Mellophones. It's a myth that Kenton helped design the Conn 16E. Conn had developed these in 1957 and the horns Kenton used were stock horns. All charts had to be redone, which was a disruption for the band. Not legit instruments, so it was hard to find people to just pick them up and play. It took an adjustment period, which lead to a lot of personnel turnover. Influenced marching band and drum corps. This album is a Johnny Richards composition. He called it a Concerto for Orchestra. Title refers to the time signatures that appear throughout the album. Unprecedented at that time. This piece has mystical numeric references to it. Be patient, the Mellophones come in late in the piece. The podcast in general -- what's the purpose? The podcast will be a meeting place for Mellophone players everywhere. Al wants to know how everyone pronounces the word "Mellophonist"? Scooter says it's pronounced "Unemployed." The podcast won't be all about corps (but Scooter will stay around anyway), though we all love corps! We need your questions! Start E-mailing us or post your questions on the forum. Scooter started as a woodwind player, but a big corps fan. He learned Mellophone, Flugel and Trumpet. Played in the Belleville Black Knights, then Star of Indiana. Formed Bluegrass Brass and sometimes plays with the Star of Indiana Alumni Corps. Mark is one of the few Jazz French Hornists in the world. Started on woodwind as well, playing Clarinet and Bass Clarinet before learning Horn. Mark gained an interest in Jazz in college and listened to a lot of studio music, where he wondered why the French Horn never got o be the soloist. It was in college that he learned how to improvise. Finally made the career move to jazz and found that the Mellophone had the sound he was after. Al did not have a jazz or corps background, but wishes he did. Still he played Mellophone for 8 years through high school and college. While playing Mellophone in the University of Alabama Million Dollar Band, he wondered why the horn got such a bad reputation. He forgot to mention that he represented the State of Alabama in the Olympics All-American Marching Band in Los Angeles in 1984. Started playing Tenor Horn and found many similarities between the Tenor Horn and the Mellophone. Started Al's Tenor Horn Page, which spun off Al's Mellophone Page. Continues to play Mellophone in pit bands. Still practices Mellophone every day and is studying improv from Mark! We can't forget Greg Monks, who is a fountain of knowledge about the history of the Mellophone and other brasses. Greg will be joining us at a later date. Don Elliott was a Trumpet player during the 50's, who also played Mellophone, Vibes, latin percussion and sang. This is his only album that features the Mellophone. Mark and Scooter discuss the inventory of Don Elliott's custom-made Conn horns. This track is a straight-ahead ballad reading. The sound quality is disappointing. You can't really tell the difference between the Mellophone and the Trombone. This is surprising since Don was an expert in sound recording. Scooter says this isn't his best work, despite all the great things he's done. This is merely mood music. Al says the album is Don Elliott's "B" material.